I really should have been on the Cambrian Way, but I just didn’t fancy it. For once I wanted to do something I wanted to do. 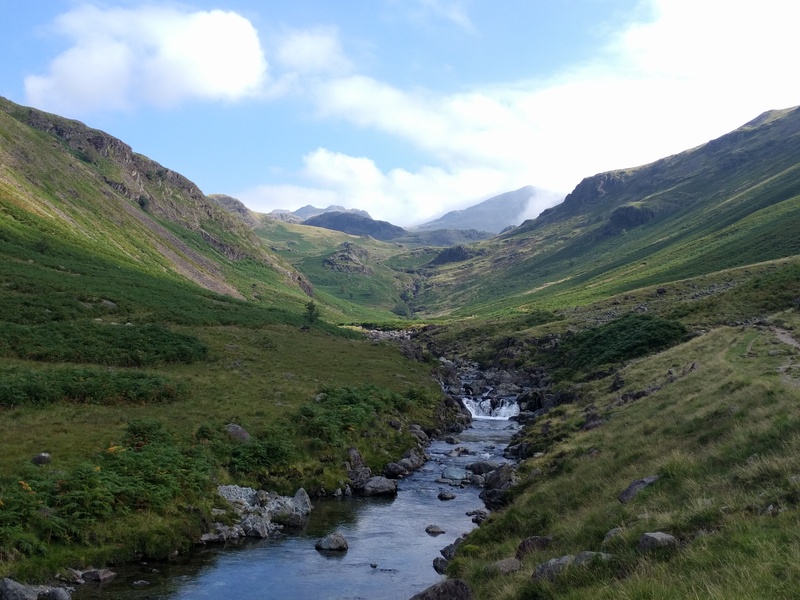 It’s been 6 years since a truly memorable trip to Eskdale, and a couple of years since a less successful one – I was itching to retread some of those paths, re-see some of those views and above all to immerse myself more deeply into the valley by spending some nights camping out there. So I did. Several iterations of mapping out routes for a backpack of about a week, saw me come up with a route starting in Borrowdale and doing a clockwise circuit of Eskdale before dropping into Wasdale and up onto the Pillar group of fells for a similar clockwise circuit of Ennerdale before returning to Borrowdale. 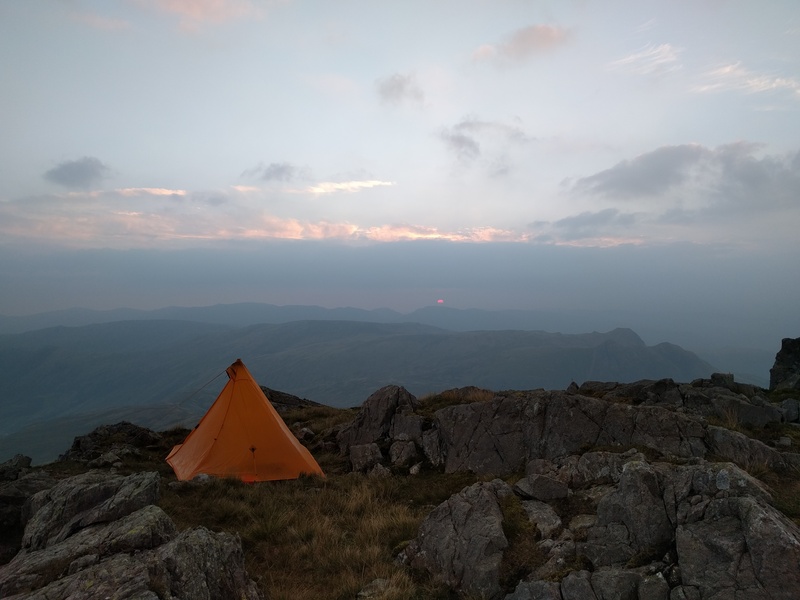 The route I came up with was an overall compromise that would see me visit as many of the fells I’ve not yet “Social Hiked” as possible, whilst also fitting in some new tarns and timing overnight camps in a few places off my wishlist. It promised to be a challenging route of about 64 miles with approaching 7,000ft of ascent. If I stayed out all week and didn’t have any major issues or lack of motivation, I could just about do it. Of course, the route had a few decent opportunities to cut the walk if needed. An early train got me to the Lakes at Saturday lunchtime, and about 2:20pm I was walking. I headed up the path to Tarn at Leaves, and thence up onto Bessyboot. A few spots of rain and a bit of a stiff breeze made sure it wasn’t a long summit stop. 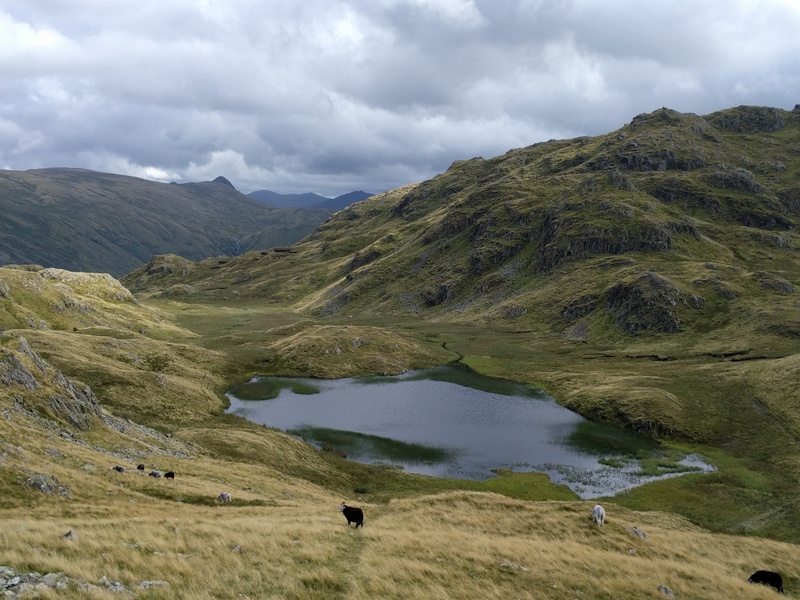 Dropping down to the tarn and conscious of time, I avoided the walk over Rosthwaite Cam, Dovenest Top, Coombe Door and Coombe Head and instead hugged a fence on the east of the hillside which brought me to Glaramara. I popped up onto the summit briefly, before continuing onto Looking Steads, Red Beck Top and High House Tarn Top. By this time I was keen to find a spot to camp, so scouted around the tarns for a likely spot. 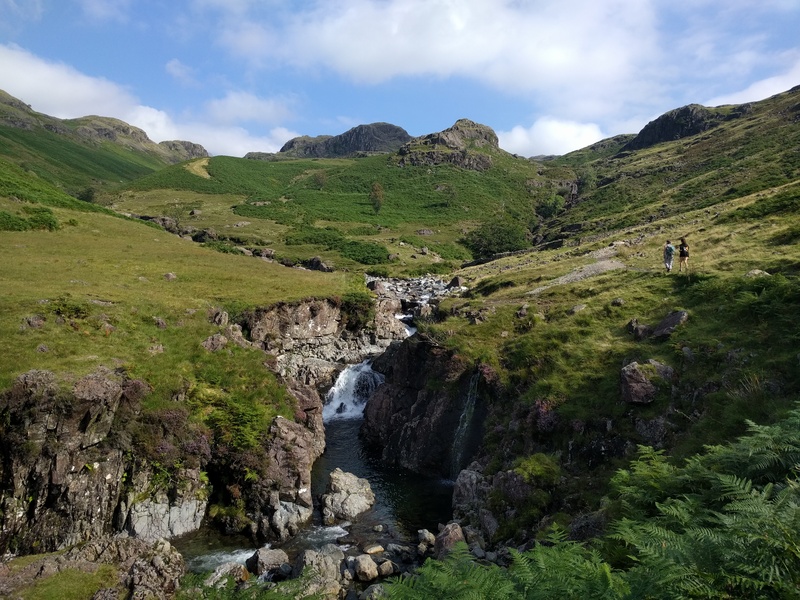 I quickly rejected the spot from last time as not being flat enough, and eventually ended up on the side of the hill overlooking the Langdale Pikes, a decent flowing stream nearby for water. The next morning begun cold and I set off from camp in my waterproof jacket for what would turn out to be the only time wearing it on the trip. 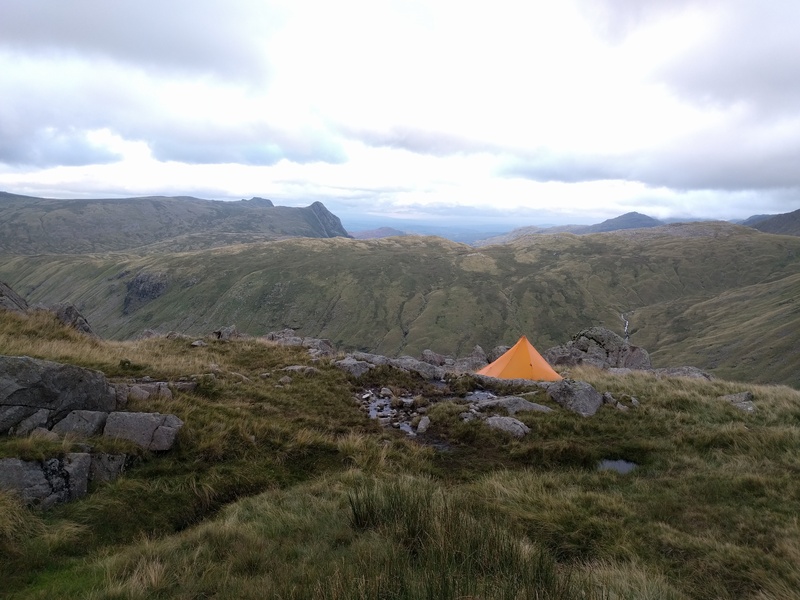 Just around the other side of High House Tarn Top, I spied a tarp with someone under it, and wandered over to say hi. He’d camped pretty much alongside the path, which wouldn’t have been my choice. 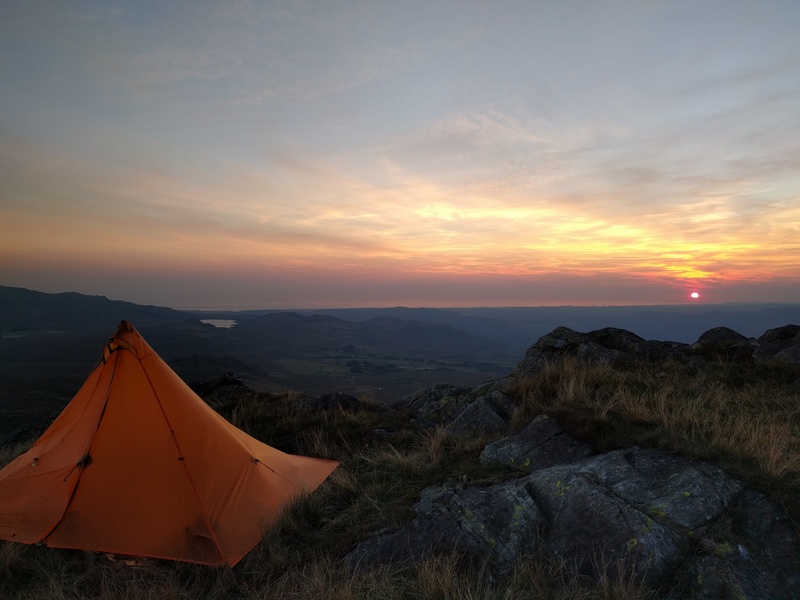 The climb up onto Allen Crags didn’t take long and once up there I spotted plenty of decent flatish spots for a potential camp. For the sake of 10 minutes more walking I’d have found a spot faster and got the tent up before I actually did last night. 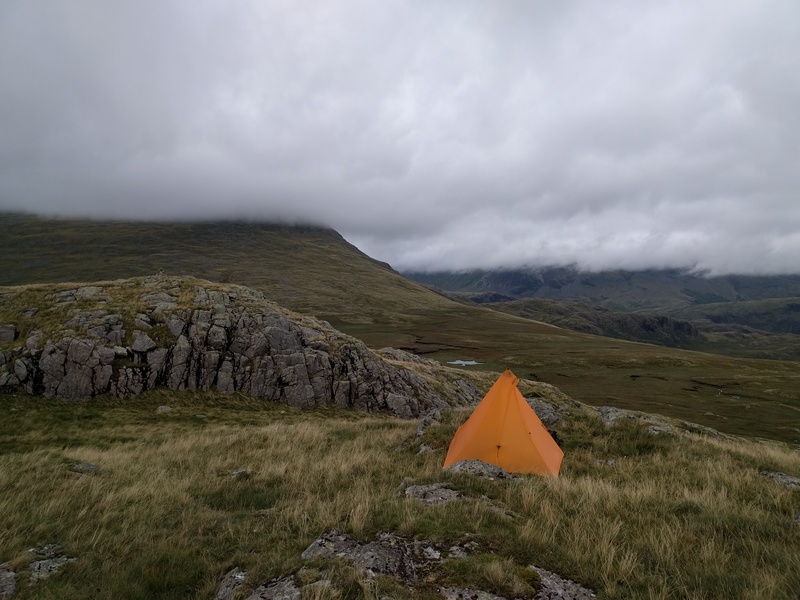 The wild camping rule that you’d always find a better pitch 10 minutes on from where you actually camped remained valid. 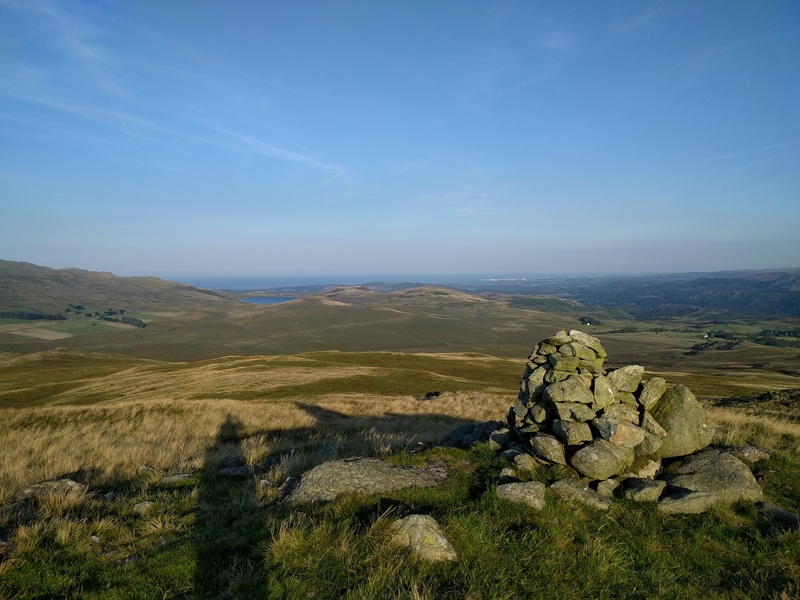 At the top of Allen Crags I had a decision – whether to continue with the original route plan and head over Esk Pike and Bowfell or an alternative over the Scafells. I chose the latter and made my way down to Esk Hause and then up Calf Cove to the boulder-hop to Scafell Pike. I noticed several people camping in the Cove. Scafell Pike itself was the usual noisy place it is, and I was keen to distance myself from people on the phone telling friends they were on Scafell Pike. 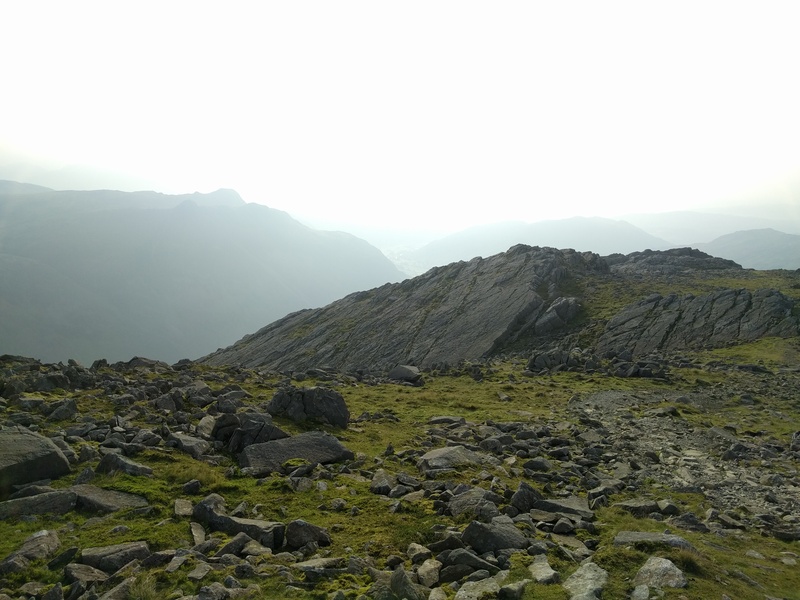 I made my way through the mist in a rough south-westerly direction to find the way down to Mickledore, it taking a while to find the actual path resulting in a bit of rough boulder hopping. 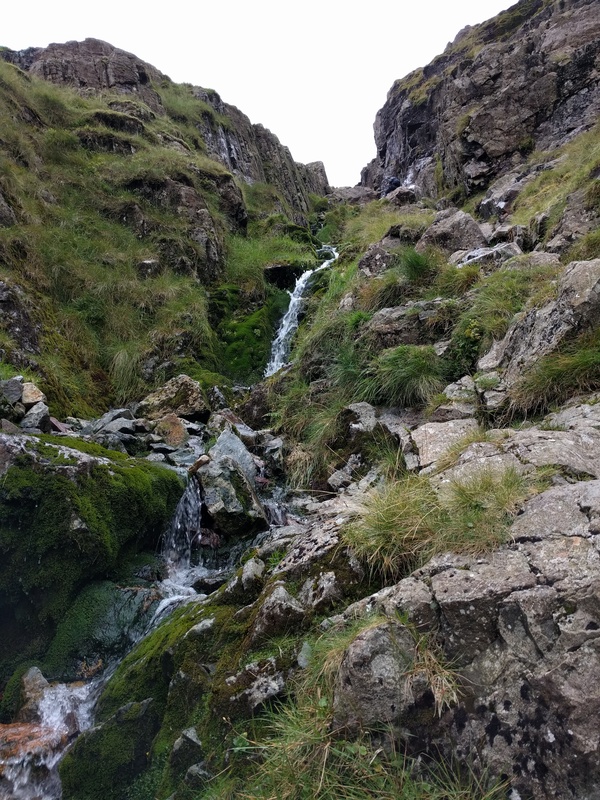 I dropped down below Broad Stand to find the path up onto Scafell, and was soon beginning the clamber up alongside the beck to Foxes Tarn. A bit wet and awkward in a few places given the load I was carrying. But even so ascent using one’s hands always seems to pass faster and easier than slogging up a path. Soon I was at the tarn, such as it was. A bit more work and I was on Scafell itself, sharing the summit with a fraction of the number of people that were on the higher summit only a short way away. Breezy and a little chilly, I dropped off the summit to find a more sheltered spot for lunch, sitting overlooking Burnmoor Tarn. At this point, I’d decided my target for the day was Great How, a place I’d wanted to visit and camp for a while. This meant I just had the descent to Slight Side and then across Quagrigg Moss to do. Both of these took longer than the view suggested it would, due to rocks and soggy ground. Eventually I pulled up on Great How and as it was a bit early, just chilled out on the spot where I intended to put the tent. A trip down for water also helped kill a bit of time. 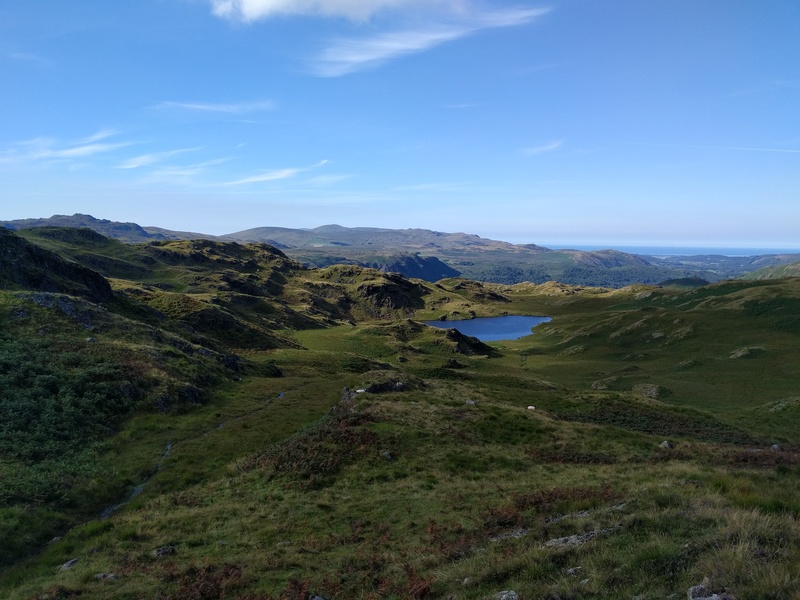 The next day dawned a lot brighter and I set off down Eskdale Fell under cerulean skies, cutting cross-country in the direction of Stony Tarn. A lot of bracken barred my path and with no sign of a “proper” path, I sucked it up and forced my way through. The tarn itself, looking stunning from a distance, was a bit less stunning close up – at least as a possible spot to camp. 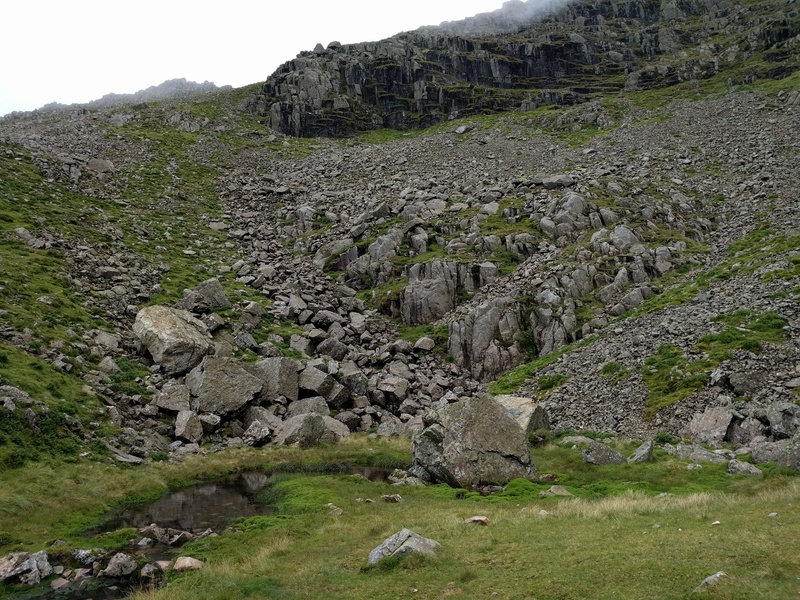 I walked down the side of it and struck out for the main path down to Eel Tarn. a path I never quite found, and so consequently I found my way down to the Woolpack Inn largely along sheep tracks. Second Breakfast was consumed, and only willpower stopped me from having a pint with it, especially as they had something I’d tasted at the Great British Beer Festival the week before (Goodhew’s Dry Stout). After a long stop I continued on my way, heading up onto Harter Fell by way of Penny Hill Farm and Spothow Gill, a shortcut directly uphill through more dense bracken. The views back up into Eskdale were pretty stunning though. A slow but steady approach saw me up onto Harter Fell. I dropped my pack and headed behind the summit outcrop for the secret way up, then retired to a seat near the trig point for a bit of a sit. 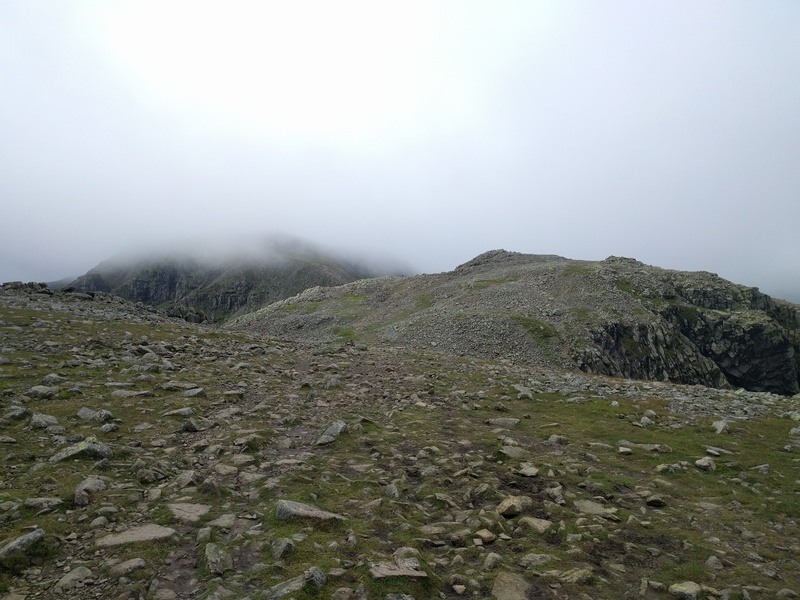 The descent to the col with Green Crag was a lot less eventful than my previous visit, and this time I also eschewed the direct frontal assault across the boggy ground. Instead I followed the bridleway to Grassguards Gill, which also gave the opportunity to fill up with water. 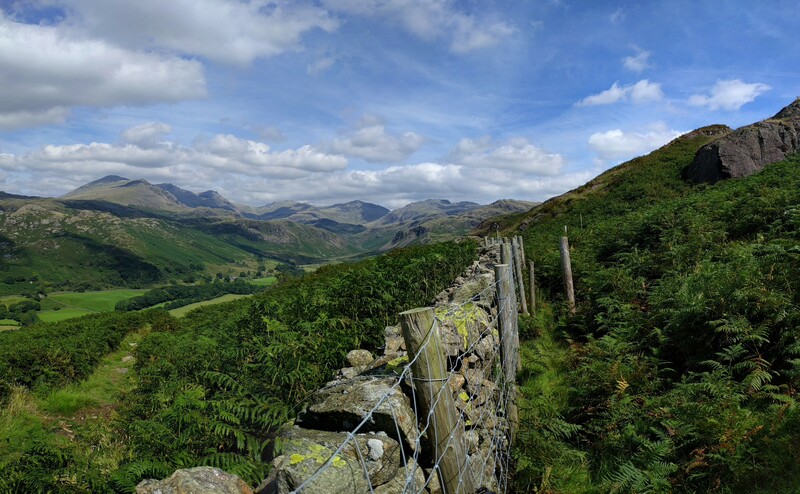 Then a drier route along the line of the public footpath brought me to Green Crag. Or Midge Crag as it should possibly be renamed. Huge clouds of midges guarded the top of the fell, only held at bay by a stiff breeze across the very summit. A choice of a sheltered but midgy pitch or an exposed but midge-free pitch saw me choose the latter and I pitched up right next to the summit cairn. 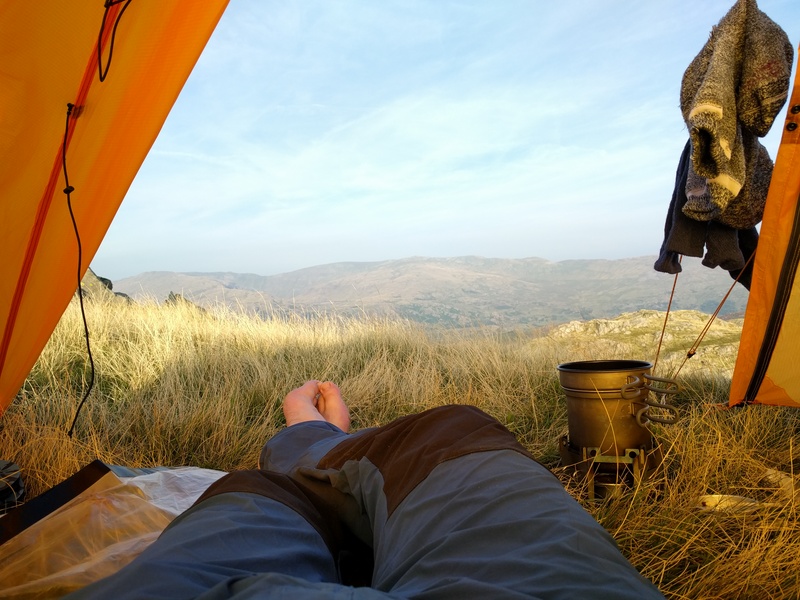 Another wishlist camp, I spent a while just lounging about enjoying the views, before watching the sun go down over Sellafield. The sun rose over the Coniston Fells, and not a moment too soon. The wind had been pounding the tent all night-long and although it never threatened destruction, the noise was enough to keep me awake a fair bit of the night. And one’s first windy pitch in a new shelter is always enough to keep you awake to check everything’s ok. Which it was. So an early start was made, but lack of sleep meant the tank was pretty low to start with. I made it across onto White How and, after a “longer than it looks” walk, to Great Worm Crag. The descent across largely pathless brackeny damp terrain took what little energy I had and I was quite glad to emerge onto the road near Dalegarth. The plan now only contained one thing – second breakfast. 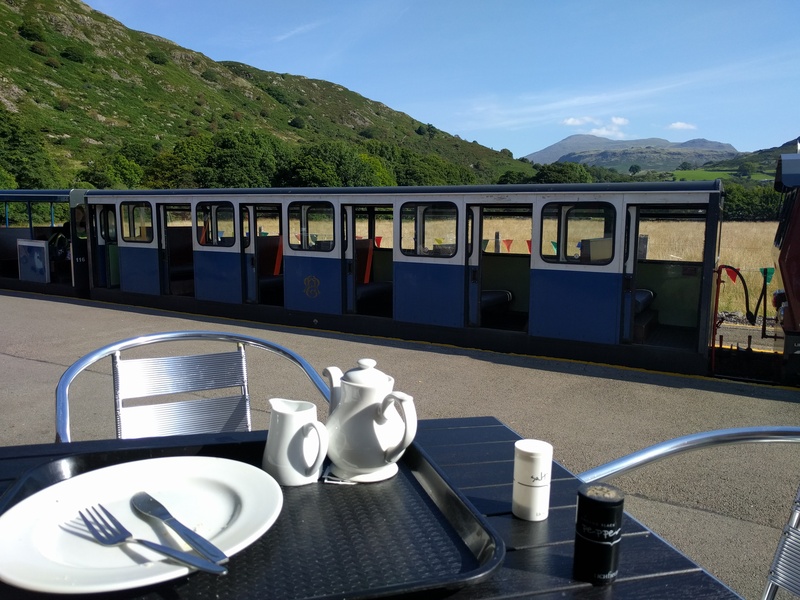 Second Breakfast (or Early Lunch) was duly taken on the platform of Dalegarth Station with a view of the Scafells. A train rolled in as I sat there and disgorged its cargo of tourists while I pondered my next move. My plan had been to head over via Burnmoor Tarn to Wasdale and climb up Yewbarrow, but I really didn’t feel up to it. The decision was made to curtail that part of the route and instead have an easy day. 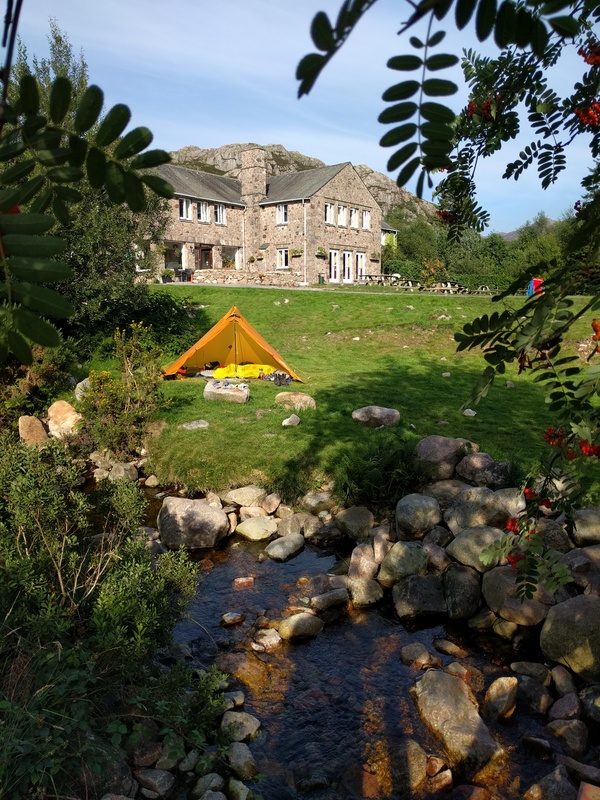 A booking was made at the youth hostel for a camping pitch (one of the best ways to enjoy a hostel as you get all the facilities but don’t have to sleep in a room of snoring farting blokes). I killed a bit of time with a pint in the Brook House Inn, and ice cream and then another pint (finally giving into the Goodhew’s) at the Woolpack. I headed along to the YHA a bit early and was lucky to be able to check-in early. The tent went up next to the stream running through the garden. A decent cooked meal that’s not come out of a freeze-dried packet, a pint and a decent sleep does wonders to recharge the reserves, and I set out next morning feeling a lot fresher. 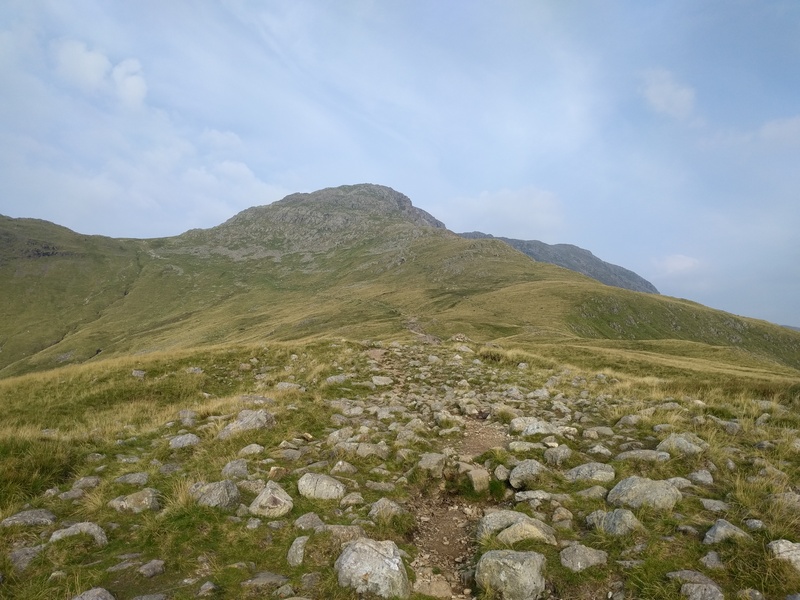 With regard to the forecast and how much more I wanted to do, the only target I set myself for today was to get to the top of Bowfell, and then decide from there. Today would be my last full day most likely. Feeling naughty that my route took me over no tops, I made my way up alongside the Esk from Brotherikeld. A gentle climb up the valley past a pair of wild campers and a family doing some wild swimming. Bowfell at the top of the valley looking pointy and majestic. At times a feeling that I had this great amphitheatre to myself. Today I allowed myself to go at the pace my legs wanted to, and to stop whenever I wanted to enjoy the view. A couple of stops were made to sketch. I climbed up from Lingcove Bridge and it was clear from the path that few venture this way compared with the more popular routes up from Langdale or along the ridge from the Crinkles or Esk Pike. I reached Three Tarns and took in one of my favourite views in Lakeland. The summit of Bowfell I also had briefly to myself and I took in the panorama. For the first time I had a view in all directions. The plan now was to head over to the north top and take stock. I did so, passing a spot in the saddle which could have housed many tents, but today was a day for camping as high as humanly possible. The North Top appeared to have such an opportunity, with a patch of grass just off the summit that was just about Duomid sized. Way too early to pitch properly I first of all just sat taking in the views then decided I’d lay out the tent on the ground to make sure it would fit and to also allow it to dry off a bit. Eventually, I put the pole in and declared my pitch. Sunset and sunrise were a little disappointing, but the camp was easily still the best camp of the trip. A still night, a 4G signal and 360° views made for that. It felt like ending on a high, and I’d sated my appetite for now. 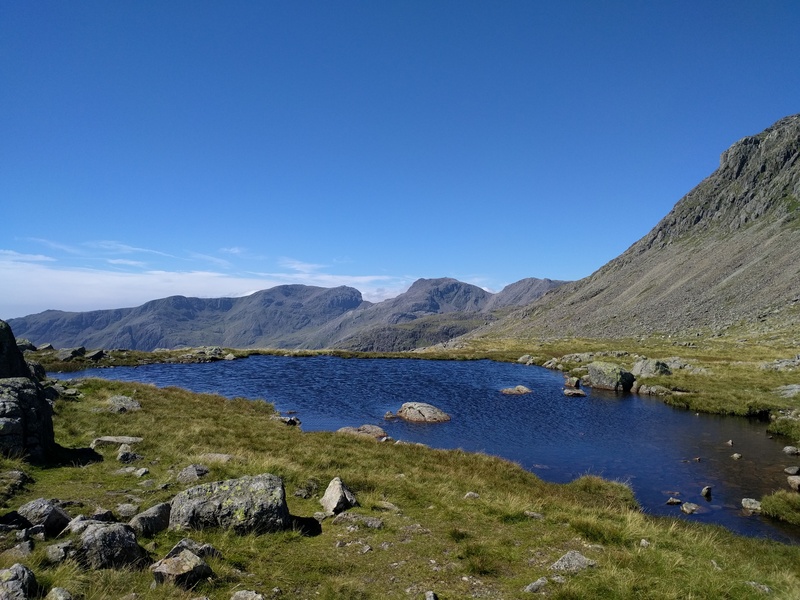 I made my way back over Bowfell to Three Tarns and down the Band, the plan being a second breakfast or early lunch then head home. 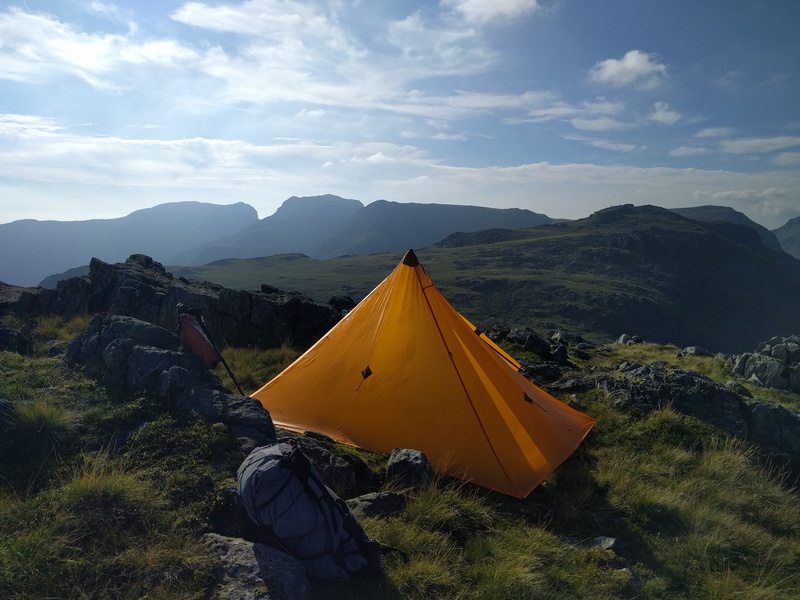 It’s difficult to describe how much I love Eskdale, and I was glad in the end that I ditched the approach of putting in as many tops as possible and languidly explored the valley itself. This is one of those places where you should just enjoy the moment. What an awesome trip, made more spectacular by your narration and images. to obviate drafts/wind blowing through. Do you find the sloping sides restrict room ?.A good weight saving I should warrant. Love that route up alongside The Esk and Lingcove Beck, amazing stuff. 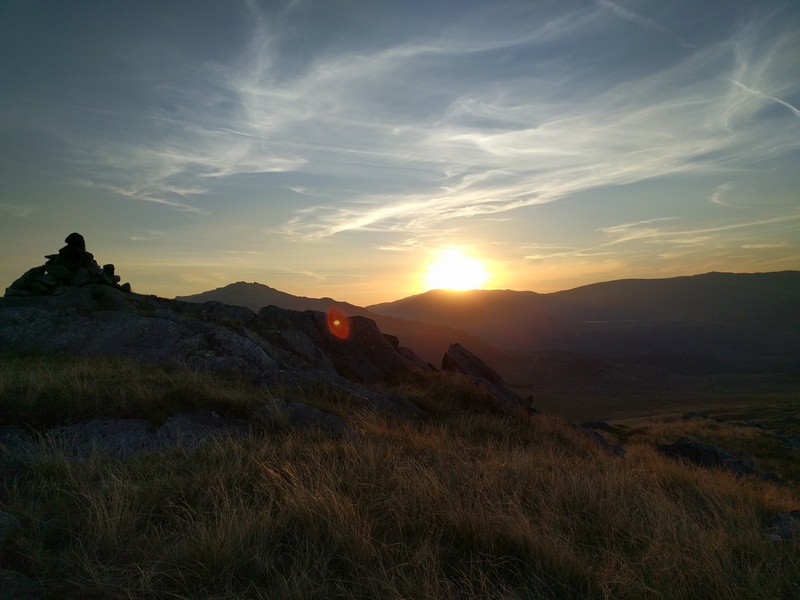 I’ve not done Harter Fell or Green Crag yet either, I’ve heard they can be boggy although I can’t imagine its any worse than Dartmoor! You’re absolutely right about spending some time doing just what you really want to do, and not returning to a project walk simply to tick off another leg. 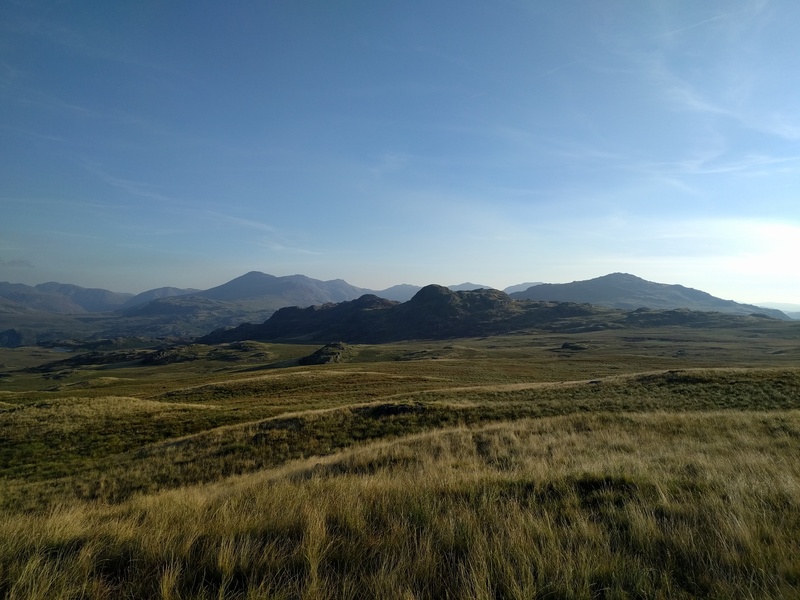 Having just finished the Cambrian Way, and admittedly not enjoyed it as much as I’d hoped, I can really see the attraction in just exploring a favourite area at a relaxed pace, no fixed agenda, no rigid timetable. I can feel myself starting to re-evaluate why I backpack, and what truly brings pleasure. And often it’s those quiet hours between the plodding, just sitting and supping with an inspiring view.